Here are some super duper cute printable kawaii candy corn cut outs you can use for your cute Halloween crafts, cards, and scrapbook pages. 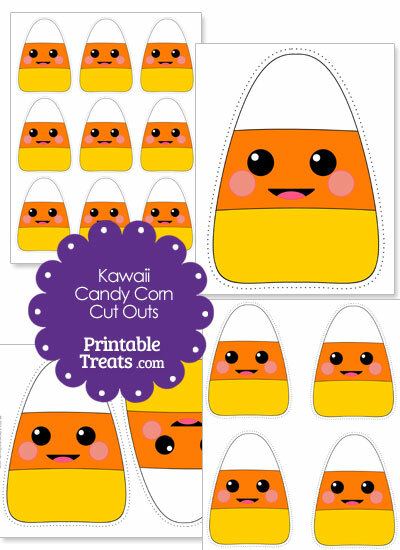 These printable kawaii candy corn cut outs have the traditional candy corn colors of yellow, orange, and white as well a cute kawaii face with rosy pink cheeks. There is a dotted outline around these cut outs so you can easily cut them out and have a great shape with a thin white outline around it. A page with one large kawaii candy corn cut out. A page with two medium-sized kawaii candy corn cut outs. A page with four smaller kawaii candy corn cut outs. A page with nine much smaller kawaii candy corn cut outs. If you would like to share the printable candy corn cut outs with a friend, please send them directly to this page so that they can download a copy for themselves. Please do not link directly to the download file.